Poor air quality affects everyone—here’s what one mom thinks you should know. Is it fog or smog? Is the air affecting my health? If you live in a metropolitan area, you’ve likely asked yourself these questions. I’m a mom to a preschooler who’s suffered from asthma since he was four months old, so I pay attention to air quality perhaps more than most. But whether you have a child with breathing issues, a parent with heart disease, or you just want to know if you should run outdoors on smoggy days, it’s useful—and important—to understand the basics. The Air Quality Index, or AQI, measures current or forecasted air quality. It consists of two measures: Particulate Matter (PM) and ozone. When you hear PM, think of solid and liquid airborne particles. While tiny, these particles can be harmful to our lungs. Even healthy people may experience eye, nose, and throat irritation from high PM levels. Those with asthma tend to struggle breathing, be more susceptible to respiratory infections, and have worsened symptoms such as wheezing and coughing. Ozone is a pungent, pale blue gas that occurs naturally in the upper atmosphere. Unfortunately, it has begun to build up at ground level, which can be bad news for our health. Like PM, it can be especially unsafe for those with asthma and lung conditions. And it’s worse for kids than adults because their lungs are still developing and they spend more time playing outdoors. Green – If you see green, go ahead and play outdoors! The PM levels are below 12. Yellow – It’s a moderate day. Unusually sensitive people should reduce time outdoors, but everyone else can continue with their normal activities. The PM level is between 12 and 35. Orange – Children, those with heart or lung diseases (such as asthma), and older adults should stay inside on an orange day. Everyone should reduce outdoor physical activity because the PM is between 35 and 55. 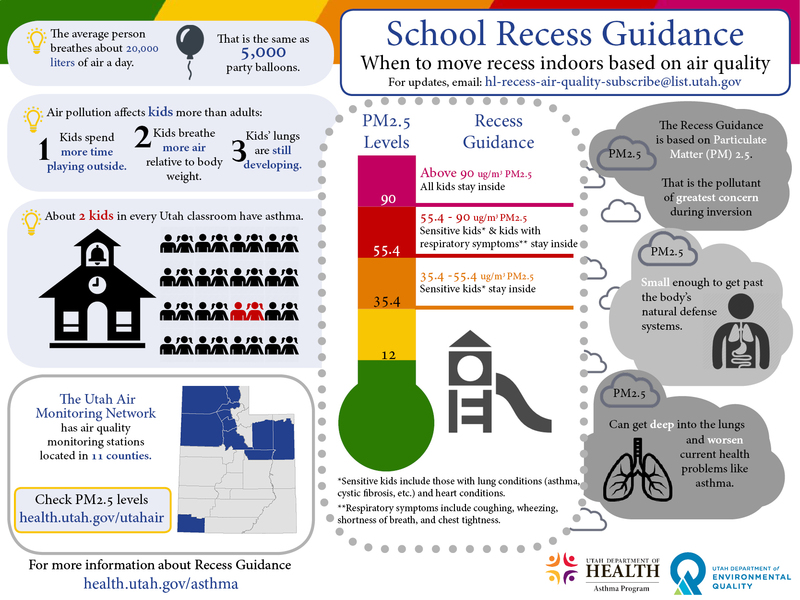 In Utah, children with asthma are kept inside for recess on orange days. Red – You know what read means: Stop. It’s a strong warning that the air may be unhealthy for everyone, even those who are physically fit and healthy. Move your run to the treadmill and find indoor activities for kids, especially those with asthma. Red corresponds to a PM of 55 to 150—Utah schoolchildren are kept indoors when levels are above 90. One last thing: Know how to check current levels. Locally, health.utah.gov is a useful resource provided by the Utah Department of Health. You’ll find current AQI conditions and lots of state resources. I also like AIRNow, an app created by the U.S. Environmental Protection Agency. I use this app to check pollutant levels while I’m out and about—it’s as easy as entering a ZIP code. Do you have tips or stories about air quality? Join the conversation on our blog or send us a tweet—we’d love to hear from you!